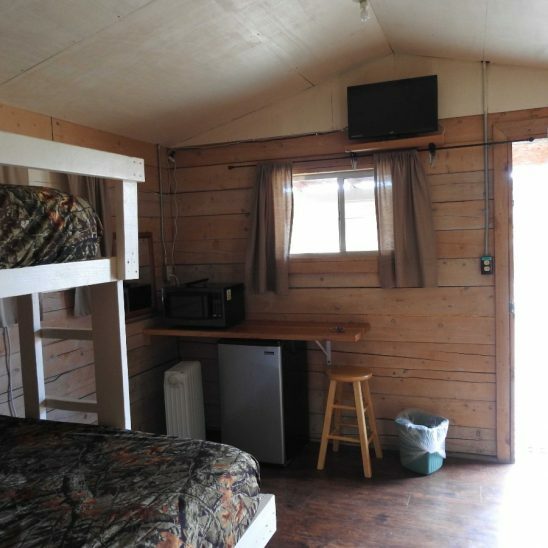 Our newly upgraded deluxe log cabins rentals measure approximately 10’x 12′. They comfortably sleep 4 to 5 people and include pillow top mattresses on 1 queen bed, and 2 bunk beds. Appliances such as a TV, refrigerator, microwave, air conditioner, and heater are all new. Each cabin comes with a covered porch, covered picnic table and grill. No Pets are to be Left Unattended in Cabins! Please note that Google directions are inaccurate. Follow our convenient driving directions here.